Pupils, staff and governors at Priory Integrated College, Holywood were delighted last week when they learned that the Holywood school is the first post primary school in Northern Ireland to win a Champion School Award for its development of iPad technology to promote learning and teaching and raise standards of achievement for all of its students. The college was presented with the prestigious award at the iLearn Convention at Mossley Mill on 25th February, attended by hundreds of educators, practitioners, representatives from Apple and other technology providers from across the UK. 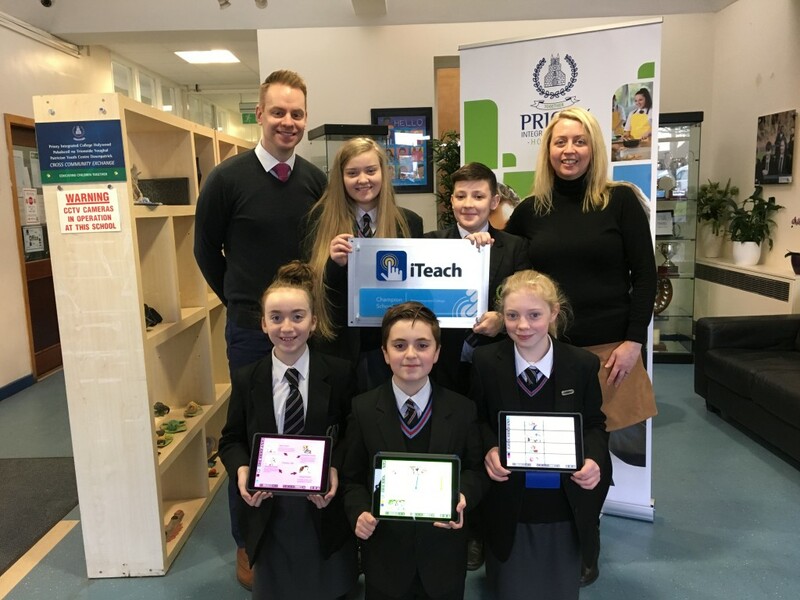 It was presented to school staff by Patrick McGrath Managing Partner of iTeach, a company devoted to helping schools and educators plan, integrate, deploy and teach with iPad in the classroom. The Champion School Award was given to Priory in recognition of the school’s sector-leading work to transform learning through the use of technology in the classroom. In order to win the award, Priory had to demonstrate exemplary leadership of its Digital Classrooms initiative, which began in 2013 with only a handful of iPads and has now grown to the point where all 600 students and every teacher in the school will have their own device by September 2016. The college was also able to demonstrate how they had cultivated a shared vision between all of its staff, pupils and parents, leading to outstanding learning and teaching across the school. In addition to the whole school award, two members of the college teaching staff were presented with Gold and Silver Teaching Awards. A Silver Teaching Award was presented to Science teacher, Mrs Stronge, for her outstanding practice in the classroom and for leading, mentoring and showcasing her work for other staff. A Gold Teaching Award was presented to Mr Mansfield, for his leadership of the Digital Classrooms Initiative and his contribution to the growth and development of iPad throughout the school. The college’s improvement journey is not over however, as it intends to embark next year on a new chapter of its development and work towards Apple’s Distinguished School Award.